As regular readers know, R.J. and I took the last two Fridays off from vlogging and blogging (sounds like some kind of winter sporting event when written like that! ), and we both needed the rest after an extremely busy, creative year. We weren't idle, though. We drove to Florida, visiting dear friends overnight, both heading south and returning home. They live in Louisville, Kentucky. Arriving near Orlando, we were able to spend two relaxing days with another couple we've counted among our group of treasured friends for many years, but hadn't seen in a long time. That was time well spent, for sure. The next four days were our personal time together, just the two of us. And where did we choose to spend it? In a place that has never failed to put us into the Holiday Spirit: Walt Disney World. When I worked there, I would always marvel at how the Parks, hotels, and public spaces could all become - literally overnight - places of Christmas enchantment! R.J. took numerous pictures of the many Christmas trees (my favorite was the one in the lobby of the Grand Floridian hotel), as well as the touches of the Season everywhere, from garlands to illuminations to trimmings on light posts. The Magic Kingdom's castle was covered in white LED lights on all its spires and roof lines, given the nightly impression of magical snow. How could one not be looking forward to Christmas with all that inspiration, coupled with the attractions and sights that always help me forget the real world for a bit. We did do a bit of work, making notes every now and then about things we plan to include in our new book, but we intended - and succeeded - in renewing with each other. It's one of the reasons our marriage has lasted so long. We make a point of indulging ourselves periodically with fun times and/or travel that serve to give us new energy and creative resolve. We've been back home for a few days, and we are busily decorating our home for Christmas, I've sent off my Christmas cards today, R.J. is completing some paintings that will be Christmas gifts, and next will come my cookie baking and prep for Christmas dinner. As an added addition to our favorite time of year, the day we got home we had our first snowfall of this winter! I hope all of you get to enjoy some restful moments like ours. They truly help, I feel, to better appreciate the joy, peace, and gifts of the Season. My next blog will be on January 5th, 2018. I should have posted this last Friday - my husband did on his social media sites - but I forgot. This will be brief. My next blog will appear on Friday, Dec. 15th, and I should have a fun one that day. Stay tuned! A Brief Post to "Advertise"
Tonight, at 8 p.m., R.J. and I will be interviewed, by phone, for a podcast. It isn't the first time we've done this; we've done quite a few in the last couple of years. I bring this to your attention because, in this new age of authorship (what a fun word! ), we are learning many new ways of promoting our books. I think back to when I began writing for publications. Computers were new - I actually attended a working seminar at Walt Disney World to learn how to use one - and the internet wasn't even dreamed of then. Publishers and agents decided how a writer's work would be announced to the public. Today, the writing field is filled with thousands who believe themselves to be writers, and the avenues to make their work known to the public are just as diverse. Inevitably, these facts result in having some writers whose work is not worthy of promotion, and some promoters who should think twice about doing podcasts. R.J. and I have been lucky enough to be interviewed by people who have done their homework; reading our books, checking out our website, etc., and they are a joy to interact with. Their results on Facebook or You Tube have been a delight, and really do result in increased interest in our writing. Only once or twice have we been disappointed by someone who was ill-prepared. I can say with confidence, because we've done this host's podcast before, that our time on-air tonight will be well spent. We list our podcasts on our website, so please check them out. We so enjoy interacting with the host or hostess and talking about our experiences. We hope you enjoy listening and will let us know (through comments here, or through email) what questions you might like answered on future broadcasts. Older Maybe, But Never "Old"
My husband, R.J., and I have a mantra for our lives: we may have to advance in age by calendar years, but we don't believe we have to get "old." We both want to live healthy, continue to be self-sufficient, and conquering new challenges when we are 100-plus in our measured lifetimes. Being lucky enough already to have creative careers with no retirement limits, we also enjoy a life where one day is never the same as the previous one, and each tireless effort has its own unique reward. This is true whether we're writing, working on an art project, acting and directing in theatre, meeting new people, travelling, or simply spending time with family and friends. We don't over schedule ourselves, and we are optimists who enjoy whatever's around the next bend, and meet it head-on. In a global world totally alien from what we knew in our younger years, we are constantly in a learning state. That keeps our heads and our hearts young. We will never be senior citizens who only associate with peers, and deride what's new in favor of "the way it was". We believe we learn and experience by engaging with people of all ages and backgrounds. Two of my favorite quotes are constant reminders of our resolve. The first is by the actress, Helen Hayes: "You rest, you rust." The second is by C.S. Lewis: You are never too old to set another goal or to dream a new dream." There is a third quote I laughingly use sometimes when asked my age, (I believe it was the actress Billie Burke who said it): "Age is only important if you are a cheese." It's flattering to have people say to R.J. and me, "You don't look your age" or "I don't know how you do it all", but we don't persist in our lifestyle to elicit such remarks. We happily persevere because it keeps us feeling good, both physically and mentally, and we wake each morning eager to see what the day will bring. It's just the best kind of ride! An important part of my research for our upcoming book, It Will Always Be WALT Disney World, involves gathering quotes by Walt Disney that will introduce our chapters. His words have inspired R.J. and I for many years, and we're hoping, by including some of them in our new effort, we can pass that inspiration on to others. Some of his more well-known remarks are framed or otherwise displayed in our home, giving us a constant reminder of this extraordinary man, and what he believed. Two of our favorites are "I only hope that we never lose sight of one thing - that it all started with a mouse", and "All our dreams can come true - if we have the courage to pursue them." Recently, as we were preparing to move into our new residence, my husband and I were discussing what to "name" this house. It's been a tradition of ours, borrowed from British friends, to give each place we've owned a unique designation. Previously, we've chosen special geographic locations that spurred creativity in one way or another. A couple of days later, R.J. was perusing a display of greeting cards at the post office, and one with a silhouette of Mickey Mouse caught his eye He picked it up and read it, then showed it to me, saying, "Read the inside." There was a quote from Walt that neither of us had ever seen before: "Imagination has no age and dreams are forever." I looked up at him and we both said the same thing at the same time: "It's a sign!" R.J. has beautifully framed that card, complete with its Mickey image and quotation, and it hangs in our entryway. Walt Disney's words now have a truly new inspiration for us, and we hope to generate that to our readers with our next published effort. It's just me connecting with readers and Disney-philes today. My dear husband R.J., is so busy with painting commissions he had to forego his usual Friday afternoon FB Live hour. That has actually given me a chance to make him the subject of my post today. Watching him at work is just as interesting for me as it is for his "fans" - and I've been watching him for over fifty years. His attention to detail, his total concentration and commitment to a canvas never waivers. I try not to interrupt him when he's at work because I know how involved he is in the process, so I was actually surprised when he started doing the video logs, painting and talking at the same time - and loving it! It's my belief that all of you who follow him on FB both inspire and invigorate him because he really looks forward to, and totally enjoys, his Friday work-time chats with all of you. In addition, I have to thank those who have been so patient, waiting for their commission works. Our searching for, buying and moving to our new home has really put both of back several months in our work. Please know how much it means to him that none of you have complained. And I can attest to the fact that he is working every day, and into the evenings, to get caught up. I know he will read this post, and smile, and state that I've gone overboard praising him. But I like to think he deserved this attention on my blog today, and I hope lots of you send me comments about your experiences watching him at work. And for those of you who follow my blog, but haven't seen R.J.'s video logs, tune in next week at 4 p.m. Central Time. I guarantee you'll be hooked! I suppose the correct title for this blog should be, "WE'RE working on it" because the words refer to the new Disney book R.J. and I are in the process of writing. But it really is just me at the moment. That's because R.J. is really busy, creating lots of commission paintings just now, so I am reading, researching, and notating, in preparation for us actually putting words on the computer screen, and getting this done by next spring. For those who don't know, we have been asked by our publisher, Theme Park Press, to pen a book about the history of Walt Disney World, from our unique perspective. That will include stories from other WDW cast members, as well as new tales from us. The book will begin with Walt's ideas for a Florida project, and continue to present day. 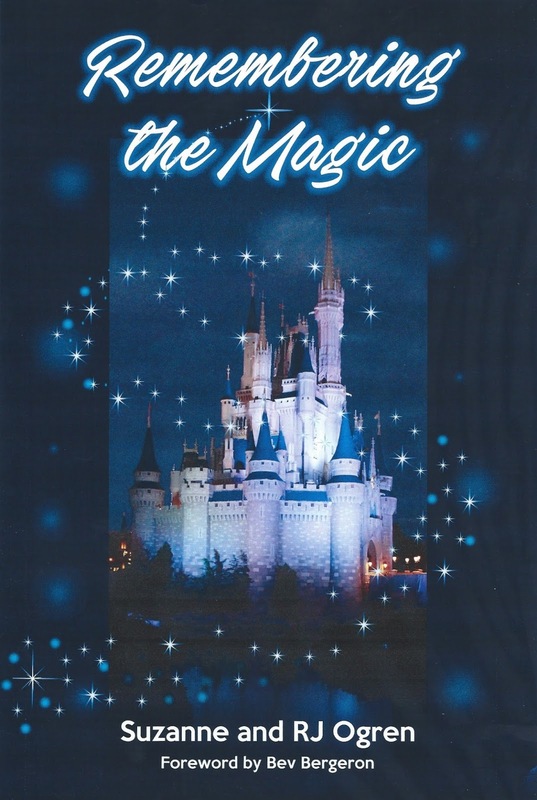 The title for the book is: It Will Always Be WALT Disney World. It was Walt's brother, Roy, who was determined that WDW be a living legacy to Walt's creativity and genius, and that will be the theme throughout. It is nostalgic to thumb though old newspapers, magazines, and Disney publications as I'm organizing our chapters and making notes. Some writers find this process tedious, but this part always gets my creative brain juices percolating. I'm rediscovering so many facts, moments in time and memories that the hardest part is deciding how to keep it fun for our readers, rather than making it just a textbook about the building and growth of the Parks. R.J. is just as eager as I am to see this one come to fruition, and we don't want to disappoint those who have given us such positive reviews about our previous Disney books. We know this one will be unique from the others, but we will be certain it is done with our personal style. So, if you're wondering what the "Disney Ogrens" are doing on any given work day, just picture R.J. in his studio, at his easel, painting away. Meanwhile, upstairs I am in my study, surrounded by papers and books spread about, with note cards in stacks on my desk as I fill legal pads with chapter ideas. And I'll keep you updated on our progress. For those of you who follow my husband, R.J., on his Facebook vlog each Friday, we both really appreciate your interest in his artwork and his stories about Walt Disney World. For the last couple of weeks, he has been mentioning my blog to you all because he knows I'm trying to build up a following of my own here. So if he is the reason you are reading this post, I thank you. And please leave a comment, so I can gauge where my new readers are hearing about me. Writing has been an important part of my life since I was quite young. I wrote my first short story at the age of nine, was the drama columnist of my high school paper. Personality profiles and travel articles for various magazines followed, after I was married, and I even penned a few screenplays (none of which ever made it to the screen). My published novel, "Ribbons" began as an idea over thirty years ago,while staying at a bed and breakfast one weekend, with R.J. I wrote a couple of chapters longhand, sitting on the porch of the Victorian getaway, and put them away when I got home. Whenever I had some free time - not often when you're raising a family and working full-time - I would sit at my typewriter (yes, it was that long ago - no computer in our house then) and add to what I'd already written. Once I had a finished draft, I actually played with the idea of changing it to a screenplay. Wrote it, but didn't like it. After quite a few years, and several drafts, I put the novel away because it just never had the spark, or the finish, that I knew it needed. It wasn't until we moved from Florida to Virginia, and were living in an historic town that I got the itch to begin again, with that town as the setting. Finally, a few years ago, now living in the Chicago suburbs, I joined a writers group, made up mostly of male writers, and revised, rewrote and enlarged on "Ribbons", with their comments, caring and critical help. The best compliment I got from one of the men in the group was when he said that, though he wasn't normally a reader of this type of novel, he was so invested in the characters, he really wanted to find out what happened to them. There it was! The characters were the stars; the plot the background for them. That was what I'd been striving for all along, and his remark let me know I'd achieved my goal at last, and I am so proud of this work. I always wanted to appeal to both women and men with this novel. Getting the nod to publish it by Theme Park Press was the final accolade for me. So, whether you are a reader of novels, or you're not, please give "Ribbons" a try - and let me know what you think. I've kept a journal since May of 1976. I'm currently writing in Volume #86, and I have no plans to stop recording the everyday happenings, the special moments, or my thoughts about life as it happens. These volumes have served me well over the years. I consult them for specific details about important dates, and our children have even asked me to look up specific remembrances over time. These handwritten tomes were of primary importance when R.J. and I were writing our first books about Walt Disney World, and, currently, I'm delving into them for our latest co-writing effort - about our take on Walt Disney World history - due to be published in the spring of 2018. All of these journals reside in the glass-enclosed bookshelves above my secretary desk in my study. Today, I took Volume 34 from the shelf, and sat down to read about the week I spent waiting for the birth of our first grandson, Alex Michael. And why that one today? Because Alex turned 22 years old today, and I wanted to relive the day he entered our lives. My mother had passed away in late July of that year, and I was still dealing with my immense sadness. On October 1st, I was greeted at the airport in Florida by my dad. He had paid for my flight so that I could be in Orlando when our daughter, Dawn, gave birth. I'm always surprised, whenever I re-read any of these pages, by the many details I've forgotten after so many years. The complex emotions of that week touched me in ways I did remember today, and I could still visualize many of the moments I had penned. I didn't recall, however, that Dawn and I finished decorating Alex's nursery the day after I arrived, with Winnie the Pooh cut-out figures that R.J. had made and painted. I was reminded as well that the baby border in the nursery was in a Mickey and Minnie theme. In addition, though I vividly remembered how long it took Alex to make his debut, I learned that, for years, I have incorrectly told people he was born at 7 p.m. in the evening, when the correct time was 8:40 p.m.! I tell you all this because I've always encouraged writers, friends, and others to keep a journal. After all these years, it is still a source of joy, emotion, remembrance and discovery for me. I often open a random volume and just sit and relive a part of my life again. I learn from it, and I treasure it for a multitude of reasons. It's my hope that, someday, when I'm no longer on earth, our children will read my journals, and not only enjoy the years I've recorded, but maybe learn a bit more about me as well that they never knew. Even if you're not a writer, you can just record what is important to you on a blank page. I guarantee that when you look back, you won't be disappointed - and you'll have a unique legacy that is totally yours. I am hoping that my loyal blog followers are still here, and are reading this post because I am "starting over" with a much needed new outlook here, and I really appreciate your sticking with me for so long. And, for those of you who are coming over to my site as new readers - thanks to my husband, R.J., and his Facebook Live vlog - thank you and welcome! I've been sporadically posting on this site for almost ten years now. In the last two years, R.J. and I have experienced a great new addition to our lives, due to our books about Walt Disney World; Together in the Dream and Remembering the Magic, being so well received by readers all over the world. It wasn't until about two months ago, though, that we were able to achieve a goal that has set both of us on a fast track of creativity: we are proud homeowners after thirteen-plus years as renters. This was a dream we thought would never happen for us again, after the nationwide financial disaster of 2008. With a perfect place we can stay in forever, we awake each day eager to pursue new creative roads. I will be posting each Friday afternoon (if something interferes, you will know about it in advance), writing during the hour or so that R.J. is on his FB video log. I will post stories, observations, etc., about Disney or my writing ventures, our theatre work, our personal lives - who knows! If you check out my blog archive (to the right on this site, just click on a year and explore), you will soon learn that I do address a variety of subjects. Once you read my blog, I really want you to send your comments and suggestions to me. That is the only way that I know you are enjoying what I'm trying to do, and I will learn what topics you want me to expand on. Please! Your input is key, so send me your thoughts. That's all for now. Just wanted all of you to know, I am exploring a new path in my "author life", and I welcome your coming along with me. See you next week! On my soapbox here today, as you can tell by my post title. Since our education system is in current jeopardy for a variety of reasons, both political and curricula based, I have to voice my writer's opinion on these two important subjects in schools. In 2010, the Common Core State Standards established a new "rule" that handwriting would now only be required teaching in kindergarten and first grade. After that, students would switch to keyboards. This edict has become practice, in spite of solid evidence that writing by hand improves letter recognition, which is the strongest help to reading success. Eminent psychologists have learned that, when 5-year-olds were shown letters that they had written by hand, brain regions that involve mastering of reading skills were used. These same regions were not used after the students typed or traced the letters. In addition, it has been proven that college students who take handwritten notes are better able to answer conceptual questions about a subject as opposed to those who type their notes. Schools today seem obsessed with "a computer for every student". Not only does this require massive amounts of money for education boards to acquire, but there are many negative results to learning when a child does not put pen to paper, or actually read from a textbook in their hands. In addition, they have difficulty calculating arithmetic by hand. I have read many articles on this subject, all of which point to the current habits by educators, parents and students. They all conclude that technology is helpful, but shouldn't be exclusive to other forms of learning. One of the best op-ed pieces I read focused on certain heads of technology, such as Steve Jobs and others in Silicon Valley executive positions, who stated that they limit their own children to screens and keyboards, going so far as to send their kids to computer-free schools. I am not suggesting that we eliminate technology entirely, It does have limited positive usage. My concern is that, in the 21st century, we are way too focused on staring at a screen, or doing all our communication by keypad. We're not only ignoring the effects for our children's futures, but we all are losing civility with our fellow man in everyday life. And I don't feel that's an exaggeration. Five months ago, I posted my last blog. Since that time, I have been non-stop busy, completing "Remembering the Magic", co-written with my husband, RJ (cover displayed here). 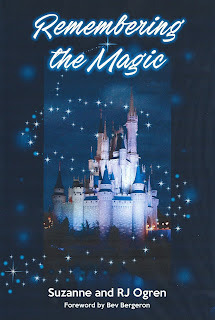 It is the sequel to our first book together, about our careers at Walt Disney World in the early decades. It was released the first week of January, and we are thrilled with the positive responses and reviews we're receiving. We are promoting it on social media, and lining up book signings and speaking engagements. In addition, I have been co-director, with my talented son, on two theatrical productions. The first was an abbreviated version of Shakespeare's "Twelfth Night", which was performed in September. The second play, "The Elephant Man", is halfway through a successful run. Both required many, many hours but we've been rewarded with two talented casts that make all that time definitely worth expending. Naturally, the "real world" has intervened several times; the Holiday season, of course, but there were also some family issues that required my attention, including my husband's brief stint in the hospital (he's fine now). If this all appears to be excuses for going so long without blogging, then let it be. I thought you deserved to know why I have been off the grid for so long. I will be resuming more regular postings, at least one a month, and you can also go to the combined website RJ and I have (rjogren.com) to see images and posts of what keeps us creatively busy. Our newest challenge, referred to in this blog title, is one without a name yet. We are quite excited that we have the green light to do a series of books about the history of Walt Disney World, from a unique perspective. That's all the detail I can give you right now, but we will begin research in about two weeks for the first volume. Keep checking back as we get underway. This venture will be ongoing for quite some time, and promises to give me lots of blog subjects, in addition to many others I've had on my mind for awhile now.